HAKAINDE Hichilema has made a fatal mistake by adopting Geoffrey Bwalya Mwamba as his presidential running mate because he is going to make the UPND lose the August general elections arising from his uncouth and vulgar languange and lack of respect for citizens especially women, Harry Kalaba has charged. Mr Kalaba said Mr Mwamba had proved that he was ‘‘untamable’’ and as a man aspiring to lead the country Zambians should be wary of what the country would become under a man whose leadership traits only manifested violent language. He said the biggest blunder Mr Hichilema made in his political life was to settle for Mr Mwamba as his running mate whom he said was propagating stone-age politics of insults and hooliganism. Mr Kalaba, who is Patriotic Front (PF) Bahati constituency aspiring candidate, said it was frightening that Mr Mwamba who had pledged to Zambians that he would be a good leader could still be using violent and apolitical language against other leaders. He said in an interview that it was, however, not surprising that Mr Mwamba could choose to verbally abuse Petauke Central PF aspiring candidate Dora Siliya for merely questioning the academic qualifications he presented to the Electoral Commission of Zambia (ECZ) as a presidential running mate. Mr Kalaba said Zambia was a Christian nation and if Mr Mwamba was aspiring to lead the country he had to learn to tame his tongue because Zambians were expecting a leadership that would be civil and decent. “The PF is celebrating that Mr Hichilema has picked GBM as his running mate because we are certain he (Mwamba) is going to help the UPND lose the general elections. 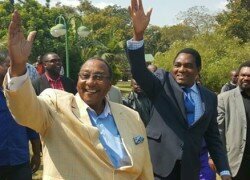 It has been the biggest blunder for Mr Hichilema to nominate Mr Mwamba as his running mate because the man has no respect for others and propagates stone-age politics of insults and hooliganism. ‘‘If Mr Mwamba is aspiring to be a leader in Zambia, he must tame his language but we know he is a man who is untamable and Zambians know him as such,” Mr Kalaba said. He advised political leaders to be sober and civil in their language and that their political discourse should be devoid of connotations that were offensive to citizens and other political leaders. Mr Kalaba said Mr Mwamba had always been an ‘‘irrationally emotional man’’ who would be a danger to the governance of the country and its diplomatic associations with other countries. “If insults and vulgar language is what would be the guiding principle for the UPND leadership, then Zambians must show them that they are politically undesirable and should vote for President Edgar Lungu who has demonstrated love, modesty and respect for Zambians,” Mr Kalaba said. Meanwhile, Dora Siliya says she is still convinced that there is more about Geoffrey Bwalya Mwamba’s qualifications presentation to the Electoral Commission of Zambia (ECZ) for his nomination as a presidential running mate in the August general elections. Ms Siliya said Zambia could not afford a trump problem where a possible republican vice-president and leader of Government business in Parliament could verbally abuse any other person. Ms Siliya said she was glad that President Edgar Lungu and the people of Zambia had placed premium on education so that in future no one would boast of doing a don’t kubeba on citizens over their qualifications. She said she could not wait to hear the true story about Mr Mwamba’s qualifications, stating that there was no reason for the UPND presidential running mate to dupe Zambians on the constitutional requirement over qualifications.